The Erlangen Comic Salon was devoted to graphic journalism. The dividing line in this genre, as it emerges, runs between dedicated journalism and ethnographic inventory. But there were also works by Dorothée de Monfreid, Paolo Bacilieri and Jeff Lemire to discover. And most of all, the Comic Salon teaches us to respect scribbles, sketches and the first final artwork. The big comic festivals are held in smaller cities. This certainly applies to the festivals in Angoulême, Lucca, Lucerne and Erlangen. And almost all of these European cities are characterized by an old town with a lot of historical buildings. The Comic Salon is heterogeneous. And less than most festivals, it is coupled to the fiction of thematic focus. There is a central exhibition, this time on comic journalism, and there are the others: retrospective, monographic, idiosyncratic. Sometimes it’s about a series like Die Unheimlichen (The Uncanny) by Isabel Kreitz and produced by her and other comic artists as an adaptation of ghost stories soon to be published in five volumes by Carlsen. This has nothing to do with highbrow vs lowbrow, as ghost stories have never claimed to be high art. And the beautiful adaptations of Der Fremde (The Stranger) (Elfriede Jelinek/Nicolas Mahler), Berenice (Edgar A. Poe/Lukas Jüliger), The Water Ghost of Harrowby Hall (John K. Bangs/Barbara Yelin), etc. reveal that das Unheimliche (the uncanny) is treated here as what it should be: a project for enthusiasts who care about careful design. © Vertigo Individual discoveries: At the Kunstverein Erlangen, the cheerful and very sociable four-legged creatures that Dorothée de Monfreid draws mainly for children’s books. (The crocodile is still feeling insulted, but what can you do?) In Hall A: the ambient comics, postcards, prints, and folded booklets by Rotopol, whose fauna is definitely related to Monfreid’s. In a room off the ballroom, the confusing diversity of Canadian comics (Toronto also has a Comic Arts Festival). 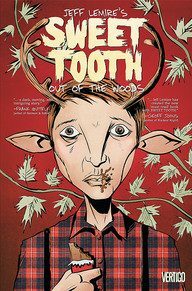 And in the hall itself, the very dark, very rich world of Jeff Lemire, who traverses several genres in his work and, with the tenebrous Sweet Tooth (Vertigo, 2010 to 2013), presented a preliminary summary of his adaptation of Canadiana. In Hall C: a very young artist whose drawings and prints pay homage to Jiro Taniguchi, who passed away in 2017. And at the avant-verlag’s stand, the enigmatic, captivating comic Fun by Paolo Bacilieri, which was just recently translated into German. Messrs. Sacco and Delisle are better known and, in their choice of locations, clearly differently aligned. They are quite interested in the materiality of everyday life. However, befitting proper photojournalistic tradition, this is everyday life in very distant countries (Delisle) or in crisis regions (Sacco). It is mapped and commentated, explored for a longer period of time and depicted with more (Delisle) or less distance (Sacco). If we wanted to draw a dividing line in this “reporters’” exhibition, it would not run between artists or between the foreign and the all too familiar scenes. On the contrary, what is outlined from Palestine (Joe Sacco, starting in 1993) to Ilakaka (Bo Soremsky, 2013) is the difference between dedicated journalism, which can also take the form of taking sides and intervention, and an ethnographic inventory, which, in addition to the vie matérielle, deals above all with the position of the observers. © Reprodukt Observe: Canadian Delisle started it in the 1990s when he worked in animation studios in China (Shenzhen) and North Korea (Pyongyang). The comics that deal with these scenarios document less everyday life on location than the everyday life of a temporary visitor who is interested in what he does not know and likes to draw what he does not understand: a perspective that continues in Burma Chronicles and Jerusalem: Chronicles from the Holy City and has long become Delisle’s trademark. Of course, there are also the introspective autobiographical works, such as the very funny Guide du mauvais père (in English: A User’s Guide to Neglectful Parenting), which has been published by Dargaud in loose succession since 2013. And an exceptional book: S’enfuir, Récit d’un otage (Hostage), which tells of a hostage-taking in Chechnya and 111 days in captivity as told by a member of Médecins Sans Frontiers (MSF). Not knowing exactly what’s going on or what the conflict is about or how best to respond: In Delisle, this is the standard feeling, which is why he has pretty good standing in the academic milieu and is closer to the work of Glidden, Kugler and Soremsky than Joe Sacco, who cannot quite rid himself of his reputation as an outraged reporter. Sarah Glidden, who became known with How to Understand Israel in 60 Days or Less about a conflict-laden study trip, accompanied a team of reporters through Turkey, Syria and Iraq in 2016 and created the comic Rolling Blackouts about it. Olivier Kugler draws for MSF, but also for the Süddeutsche Zeitung, The Guardian and The New Yorker, like Glidden often from the position of a second-tier observer trailing in the wake of more savvy travelers. Bo Soremsky’s work Ilakaka was created as part of a cross-media reportage for arte. Like Patrick Chappatte’s series “The Last Phone Call” for the website of the New York Times, she puts the reporter-illustrator into the picture without making too much of a fuss about him. The exhibition documents the fact that the reportages have long been cross-media (websites, films, comics, collaborations with newspapers and broadcasters) while at the same time endeavouring to portray what it shows not only as media products but also the working process. The respect for scribbles, the sketches, the first final artwork is one of the aspects that almost always make comic exhibitions seem likeable with a great sensibility for the work-in-progress and at least a few walls reserved for the interim results, of which more could be seen here. 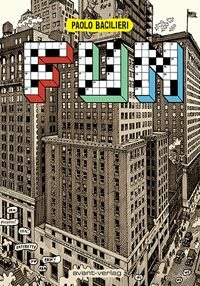 However, Zeich(n)en der Zeit still conveys enough of the time span that defines comic journalism – as a collaboration, project, journey and craft – and that determines its growing success more than questions of research or representationality. The awards? They are less significant in Erlangen than in Angoulême. 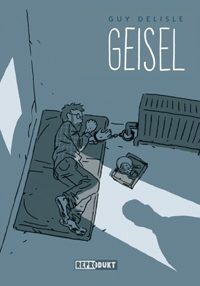 But Ulli Lust’s Wie ich versuchte, ein guter Mensch zu sein (How I tried to be a good person) (Best German Comic) is no less interesting than Lust’s debut about a disastrous trip to Italy. Esthers Tagebücher (Esther’s Diaries) (Best International Comic), continued until the title heroine’s 18th birthday, are a wonderful experiment in long-term observation. And on Friday evening Reinhard Kleist, who has already received countless awards in Erlangen, was named the best German-language comic artist. Anyone who has read his two books about Nick Cave definitely went to the Berlin concert on July 14th. This text originally appeared on June 7, 2018 in the culture blog Der Perlentaucher. Stefanie Diekmann is professor of media culture at the University of Hildesheim. Copyright: Used with kind permission of the author.